On March 23, 1999, dietary supplement companies will have made the transition from an "anything goes" label to a federally imposed label similar to the one now required for foods. 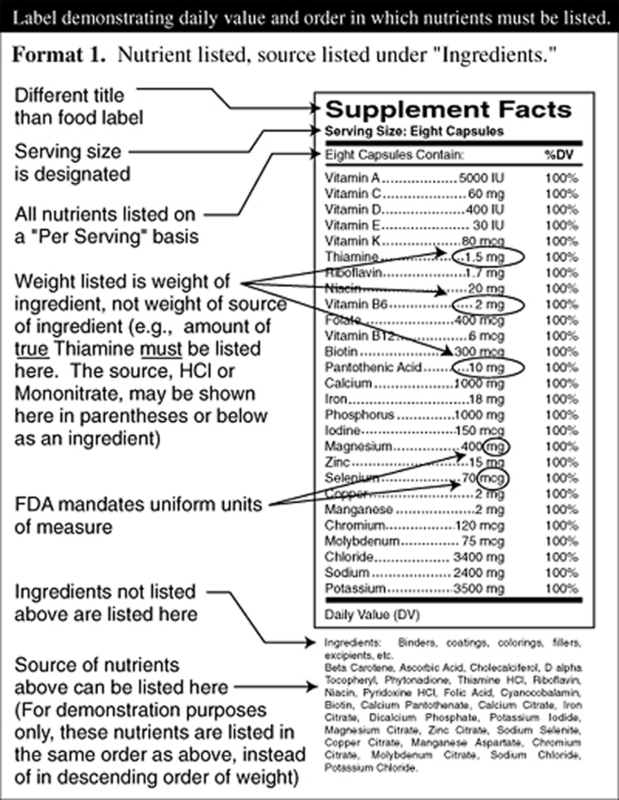 Forever after, dietary supplements shipped in interstate commerce must have the new "Supplement Facts" label attached. 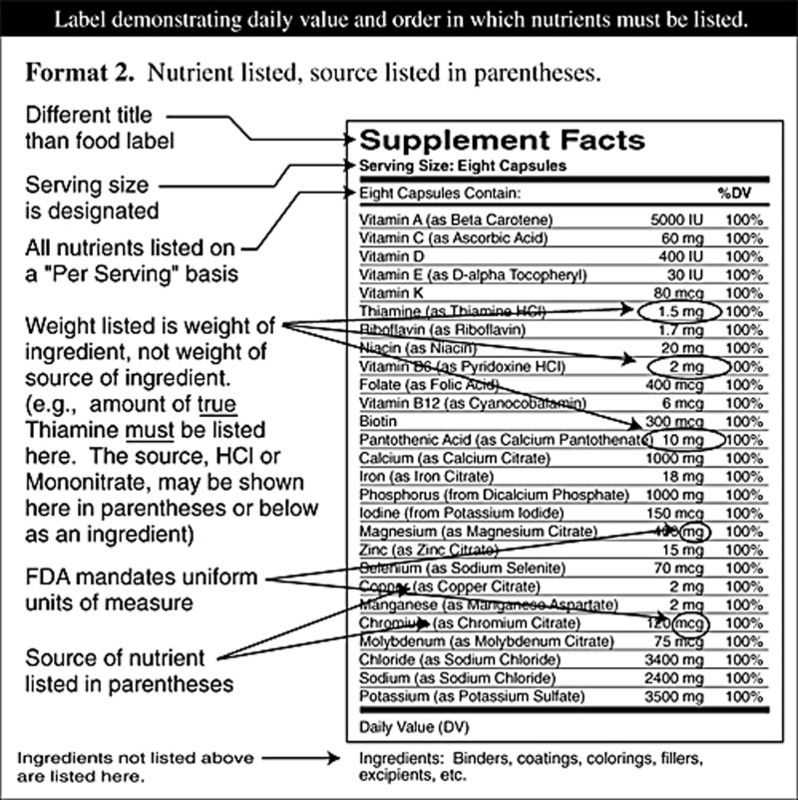 The following outline is a general guide to a purchaser of dietary supplements regarding what information the new "Supplement Facts" label must disclose. In addition, the existence of other pertinent information, not required to be disclosed by the new label, is also outlined. The FDA labeling regulation requires ingredients designated as having a "Daily Reference Value" or a "Reference Daily Intake" to be listed in a specific order, with the same nomenclature, and with the percentage of Daily Reference Value delineated. Minerals must list their salt sources in a uniform format. Herbs and herbal extracts must be listed with their common name and Latin name as delineated by the American Herbal Products Association official listing "Herbs of Commerce," as well as the plant part which is used. Fillers (used to fill space). The following is a list of many such additives grouped into general categories relative to their potential to cause allergic or sensitivity reactions, impede absorption, or have an undesired physiological effect. Universally tolerated, generally inert product additives: Individual amino acids. Basic minerals ­ Calcium, Magnesium, etc., as Oxides, Carbonates, Phosphates or Organic Acid complexes, e.g., Calcium Citrate or Magnesium Aspartate, Ascorbate, Malate, etc., but not "Amino Acid Chelates," which can contain partially digested protein instead of pure amino acids. Also, Titanium Dioxide (the white color used in some tablets and capsules), Silicon Dioxide (fumed Silica), Talc, and Silicates (Ca, Mg). Generally well-tolerated product additives: Cellulose as filler, binder, or coating, generally labeled as: Cellulose, Hydroxypropyl Methylcellulose, Ethyl Cellulose, Hydroxypropyl Cellulose, Microcrystalline Cellulose, and Croscarmellose Sodium. Also, Crospovidones, Bentonite, and Polysorbates. Generally tolerated additives, with possibility of sensitive patient reaction: Sodium Starch Glycolate, Starch, Mannitol, Sucrose, Acacia and other gums. Preservatives such as Benzoates, Parabens, Sorbates and Propionates. Antioxidants such as BHT and BHA. Coatings such as Pharmaceutical Glaze and Zein ­ (See Coatings in "NAME DECEPTION"). Additives utilized for economy or appearance, presenting potential patient problems: Lactose, Corn Starch, Sucrose, all FD&C dye lakes, all organic coloring agents. Additives utilized in virtually all tablets and most capsules* for lubrication which impede absorption and present the possibility of patient sensitivity: Stearic acid, Magnesium Stearate, Calcium Stearate, Ascorbyl Palmitate, Fractionated Vegetable Oil, Hydrogenated Vegetable Oil, Castor Oil, etc. (See Lubricants in "NAME DECEPTION"). Lubricants enable manufacturing machines to run more efficiently but inhibit eventual dissolution of the nutrient. 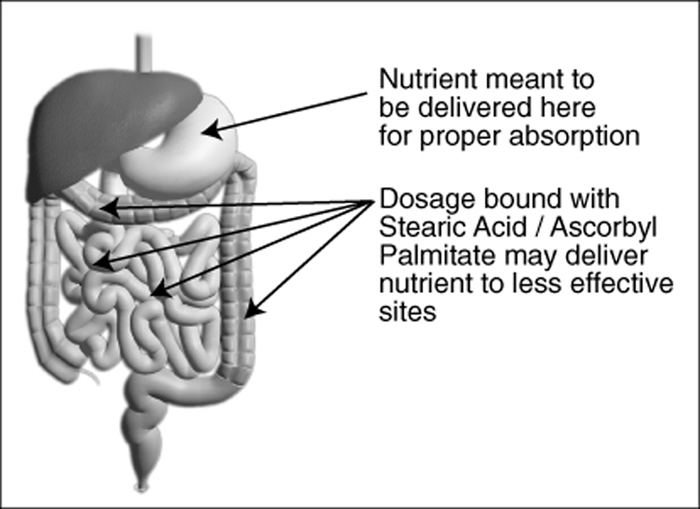 Each nutrient particle is coated with a layer of Stearic, Palmitic or other fatty acid, which may prevent absorption by a patient with a compromised digestive system. It also presents the problem that delivery of the active ingredient may be considerably further down the intestinal tract than the site originally intended. Potentially this may result in a nutrient being delivered distal to its optimal absorption site. Not only can this impede absorption, in some cases it might be harmful. Name Deception: In many cases, an ingredient carries a negative connotation, so the manufacturer uses instead an euphemistically derived alternative. Deceptive names for Coatings: Pharmaceutical Glaze, Confectioners Glaze or Natural Glaze are names for SHELLAC. Natural Vegetable Coating, Natural Protein Coating, Vegetable Coating, and Maize Protein are names for Zein which is CORN PROTEIN. Deceptive names for Lubricants: Stearates are primarily Stearic Acid, alone or complexed with another ingredient, such as magnesium. The National Formulary monograph requires that Stearic Acid be composed of at least 40-percent Palmitic Acid, which has the same properties as refined Stearic Acid. 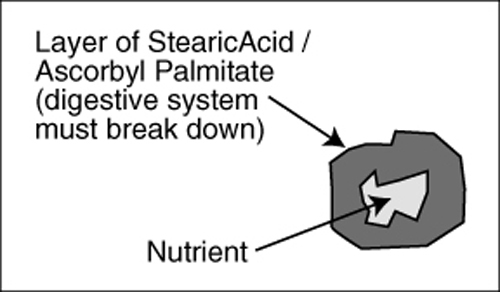 A small amount of Ascorbyl Palmitate (palmitic acid) is added to many products as a "Vitamin C source;" however, its purpose in almost all cases is to act as a lubricant to aid in tabletting or capsuling although it has the same negative properties as Stearic Acid (reduced dissolution and inhibited absorption). (see Figure 4 and figure 5) Castor Oil as an ingredient is usually Hydrogenated Castor Oil; it can exhibit the same properties as Stearic Acid, as can other oils utilized in the manufacture of tablets and most encapsulated products. 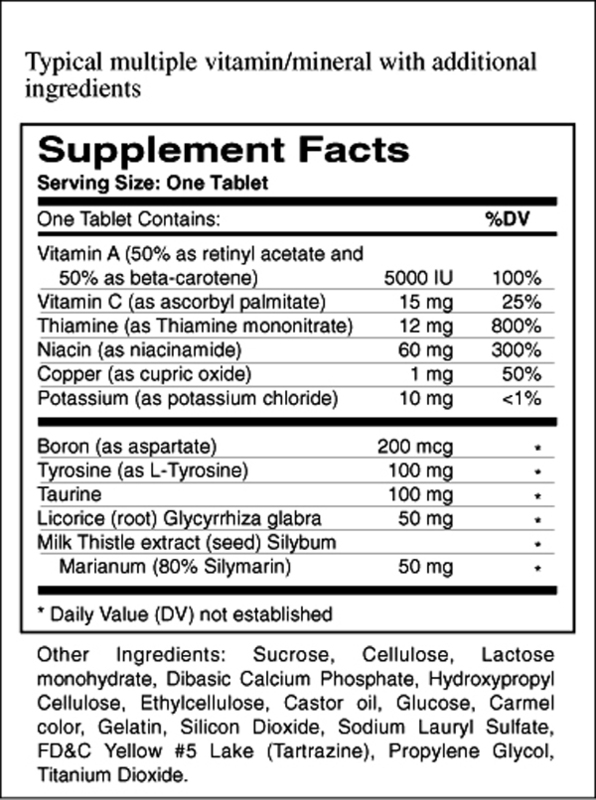 What's not disclosed: INGREDIENTS NOT "ADDED" BY THE MANUFACTURER Kudos to the FDA for requiring better and more consistent labeling, although the mandated "Supplement Facts" panel is rather cosmetically flawed. The problem remains, however, and will always remain, that there are ingredients the purchaser of a dietary supplement may never be aware of. These are the ingredients already in the raw material purchased by the manufacturer. As an example, two apparently identical labels are shown, both of which include what appears to be similar ingredients. (see figure 6 ) Product A is made by a manufacturer with concern for quality ingredients ­ Product B is made in a very typical manner, with no excipients listed; however, the raw material choices show the difference. 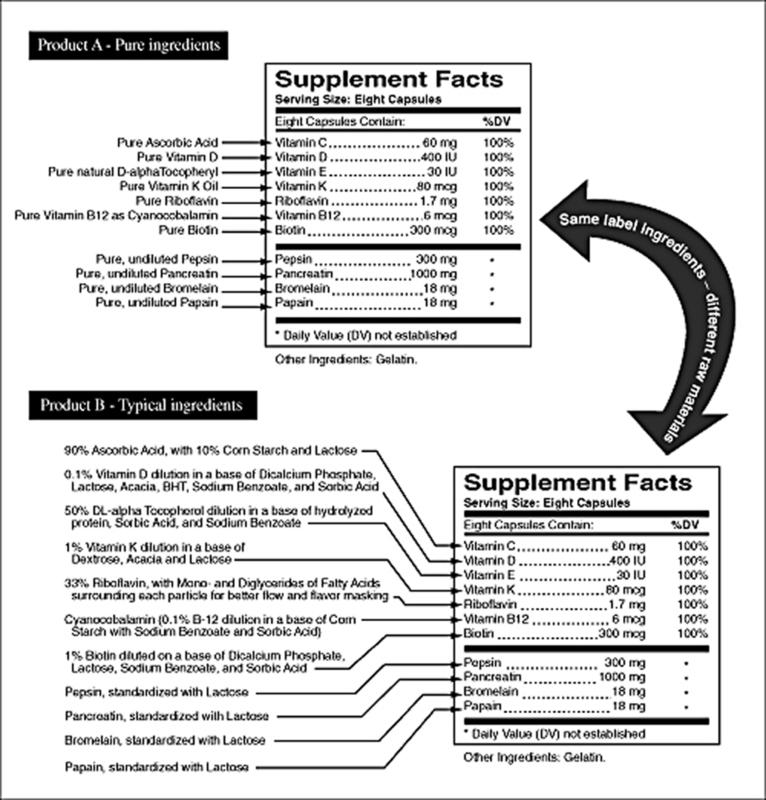 The comparison of Product A and Product B is not unique to dietary supplements ­ the same issue exists with regard to the labeling of food products. The critical point, however, is that many of the ingredients in raw materials are considered minor manufacturing additives that are not required to be listed on the label. For the FDA to require otherwise ­ mandating the labeling of each and every "minor ingredient" in a dietary supplement ­ would create a labeling nightmare. For example, if a manufacturer usually purchased an ingredient in a base of Dicalcium Phosphate, and his supplier ran out, and the only similar ingredient available was in a base of Calcium Carbonate, a label change would be necessary to include this new "sub-ingredient." But such is not now the case. The "Supplement Facts" label will bring more information to consumers of dietary supplements, and will do so in a consistent and easily recognizable format. However, disclosure of the "Supplement Facts" is not disclosure of "All The Facts." Thus, disclosure of many of the ingredients in dietary supplements ­ Binders, Lubricants, Coatings, Colorings, and Fillers ­ will remain at the discretion of the manufacturer, in whose interest disclosure may be uncertain. Remington's Pharmaceutical Sciences, 16th Edition. Various manufacturers' literature, data and technical directives.